The YUMbrella Ultralight Flash Mob allows anglers to throw five lures at once, simulating a small school of baitfish. This Yumbrella Rig has all of the great features as the original Yumbrella Rig plus 4 willow blades to give it the extra flash! 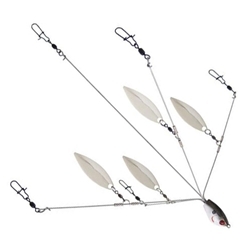 Each lure arm and the main wire are stainless steel that has been repeatedly heat-tempered to create a Super-Wire unmatched in strength and memory. In addition, the snap and swivel are top-quality and super-strong to ensure flawless performance. This lightweight Yumbrella rig can be thrown on any type of rod and reel and is perfect for ponds, streams, rivers and lakes.